(February 7, 2019)- On February 6, 2019, around 1:47 AM, Cape Coral Police responded to a call for service at 1107 Patterson Rd in reference to a burglary in progress. The complainant called and stated the home in question had been abandoned for 2 to 3 years but saw a vehicle in the driveway and a subject with a flashlight around the house. 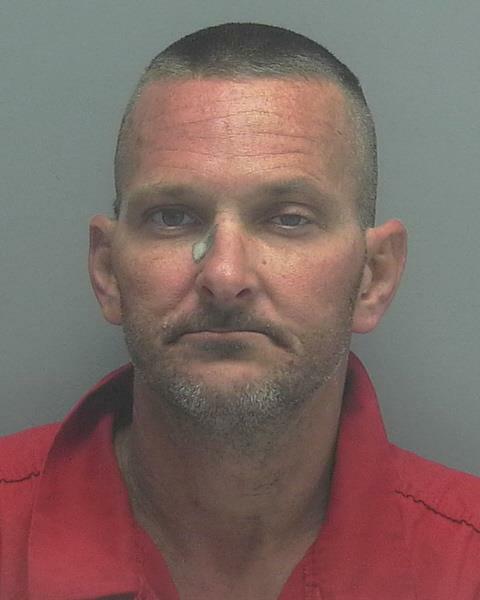 Upon Cape Coral Police arrival, there was a van in front of the home with Christopher David Viens (W/M, DOB: 02/015/1975, 3421 Palm Beach Blvd, Fort Myers) sitting inside with a flashlight on his head. Officers approached Viens and ordered him to step out of the vehicle. Viens started reaching around his feet by the floorboard in the vehicle. Officer’s ordered Viens to show his hands and to stop reaching around but he continued to reach by his feet, so Officer Chesnut opened the door and grabbed Viens by the arm who was reaching for a tool on the floor with his other arm. Viens then pulled away from Officer Chesnut and attempted to run. Officer Meadows was able to grab Viens by the arms and detain him once on the ground. Once on the ground the officers noticed Viens had a holstered firearm that he was carrying on his belt. Viens was placed into handcuffs and the firearm was removed from his belt. The firearm was not reported stolen. A record check revealed that Viens is a convicted felon. Officers were unable to make contact with the owner of the home to determine if Viens had permission to enter the residence. Viens was charged with Possession of a Firearm by a Convicted Felon, Carrying a Concealed Firearm, Loitering and Prowling, and Resisting Arrest Without Violence early this morning and later transferred to the Lee County Jail. On February 6, 2019, around 10:00 AM, Detective A. Mino-Ramirez was able to locate the owner of the residence who did not give anyone permission to enter the residence. A search warrant was conducted on the van Viens was in possession and inside were twenty-one bags with empty aluminum cans, numerous DVD’s, records, kitchen utensils, and liquor. Also on the front passenger seat was a police style gun belt with a baton, several knives, and a steel cord was located. All items with the exception of the gun belt and knives were from the victim’s residence. Based on the follow-up investigation Viens was additionally charged with Armed Burglary of a Dwelling and Grand Theft.